Lucia hits Gayle’s nervous system, switches him to Godzilla mode. 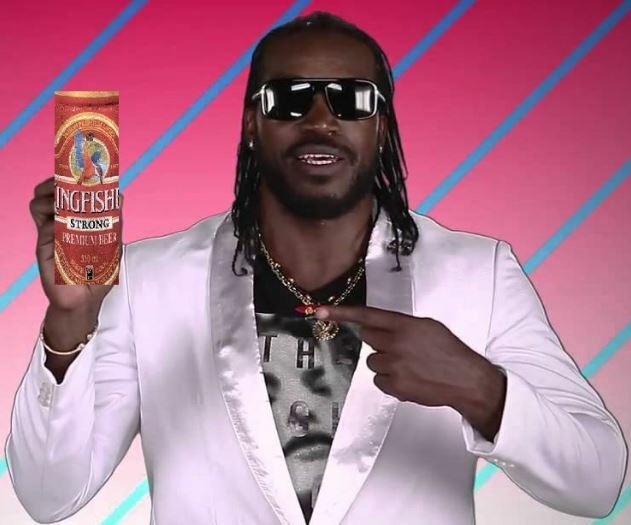 Anti-doping agency has confirmed that just before the match Christopher Henry Gayle took a sip of Kingfisher beer, which seem to be adulterated with Lucia medicine. The probe was initiated as Chris Gayle (who hasn’t played for the need of the nation since the inception of the IPL) scored a barbaric double ton today against Zimbabwe. Gayle has admitted that due to the chemical locha, he could see Vijay Mallya hovering over his head and was allegedly tricked that it was a RCB game and he wasn’t using his skill for free for the Caribbean board. With every ball that he faced, he could hear a voice that said “Every six is proportional to a date with the Kingfisher calendar girl. #SwalpaHitMaadi” and that kept him going for the kill. The effect of the medicine was prominent till he reached the 200 mark but by the time he regained his consciousness the damage was already done. Meanwhile Gayle has been roped in as the brand ambassador of a new North Korean medicine brand – “Being Inhumane” .The PR agencies have suggested that due to his extraordinary dancing skills he was offered the contract as a potential threat to South Korea’s PSY. MoM- Chris Gayle for his monstrous knock of 215 off 147 balls and a spell of 6-35-2. This entry was posted in Humour and tagged #ICCWorldCup2015, Chris Gayle, Kingfisher, Lucia, PSY by lalitvijay. Bookmark the permalink.